Quiz bowl (or quizbowl) is a family of games of questions and answers on all topics of human knowledge that is commonly played by students enrolled in high school or college, although some participants begin in middle or even elementary school. Participants may benefit from studying a broad range of academic subjects, increasing memorization and study skills, learning to work in teams and expanding capacity for responsibility. The game is typically played with a lockout buzzer system between some number of teams, most commonly two teams of four or five players each. A moderator reads questions to the teams, whose players endeavor to buzz in first with the correct answer, scoring points for their team. Quiz bowl is also known by various other names, such as Academic Bowl, Academic Challenge, Academic League, Academic Team, Battle of the Brains, Brain Bowl, Brain Game, College Bowl, It’s Academic, Knowledge Bowl, Scholar Quiz Bowl, Scholastic Bowl, and Scholar’s Bowl. 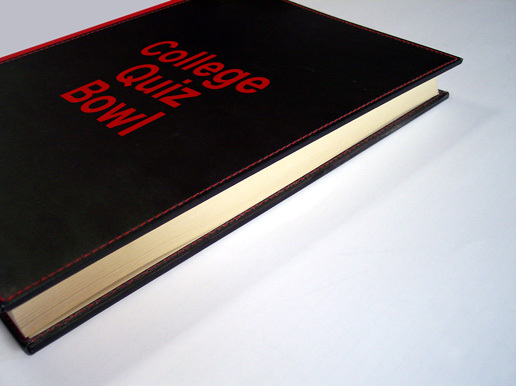 There are several different formats of quiz bowl, but they generally share the following rules for playing. Two teams of (typically) 4 players, sometimes 5, each sit at a buzzer set, which is like a set of TV game show buzzers. Anyone who rings or buzzes in prevents anyone else from doing so. If a round is timed, a countdown timer is used. Most questions have a 5 second time limit after a question has been read. Each game is played with a packet of questions, which a moderator reads. There are two basic types of questions asked: tossups (typically worth 10-15 points) and bonuses (worth a maximum of 20–40 points). Other types of questions include lightning or rapid-fire rounds, which usually consist of ten questions and sixty seconds, with only one team given the chance to respond. The other team may have the chance to answer the questions the first team missed; then the second team gets its own set of questions, and the first team may get to answer any missed questions. Tossup questions, commonly referred to as tossups, can be answered by any player from either team. Tossups must be answered individually, without the aid of teammates or the audience. Aid by teammates is known as conferring and is generally not allowed. The first person from either side to buzz in may attempt to answer the question. Unlike the current version of Jeopardy!, one may interrupt the moderator and give an answer. If the answer given is incorrect, then no other member of their team may attempt to answer and only players from the other team may buzz in. Only one player per team may try to answer a given question. In most American formats, correct tossup answers earn the team 10 points. In some formats, if the question is answered prior to a certain clue in the question, the team earns 15 or 20 points. In some formats, answering the question incorrectly after interrupting the question, results in a five point penalty. If a tossup is successfully answered, the answerer’s team is given control of a bonus question. The bonus question is usually given in multiple parts, with each part being worth a stated number of points. Teams are generally permitted to confer with each other on these questions. In some formats, only the team which answered the tossup question correctly can answer the bonus. In other formats, the other team is given an opportunity to answer any parts of the bonus that were not answered by the team in control of the bonus. Bonuses can only be answered by one team (at the high school level, some formats allow the other team to answer parts of the bonus question which the first team fails to answer; this is called rebounding or a bounce-back). The team may work together (confer) to answer the bonus question. Usually, bonus questions require multi-part answers, and tossups single-part answers. Games are either played in timed halves, or until a set number of tossups are read. In the case of a tied score, a tiebreaker is used. The nature of the tiebreaker varies by tournament and format. If a player or team feels that a question is in error, a protest may be made. If the tossup would have affected the outcome of the game then the question is held for reevaluation, at which time points are adjusted if necessary. Overtime only happens if there is a tie at the end of regulation play. This varies from format to format, and may include extra toss-ups until the score changes, entire toss-up/bonus sets until one team leads at the end of a set, a multiple-toss-up playoff, or a timed period of 1 to 3 minutes. Over the years buzzers from buzzersystems.com, insurance for foreign teams from nriol.net, and practice sample from naqt.com have come handy at meets.